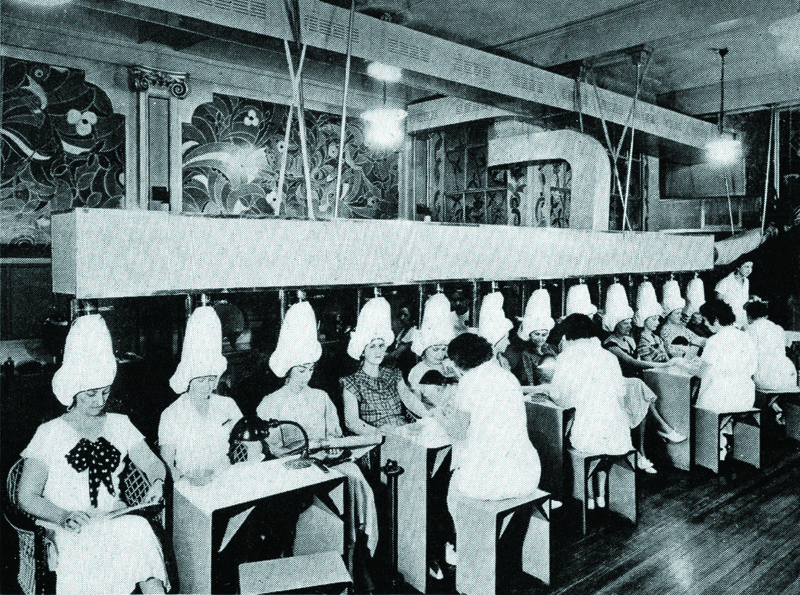 The Beauty Salon of Boggs and Buhl Department Store in Pittsburgh, PA grew its clientele with the help of an air conditioning system. Multiple clients having heat services at the same time. The hair drying room of the Beauty Salon in R.H. Stearns of Boston, can operate at a comfortable temperature all year-long. The air conditioning system installed at McGavran’s Marie Earle Salon. Can you see yourself working in a salon when the temperature is 110 degrees or more? Imagine providing services for heat-fatigued, uncomfortable women. It’s not a pretty picture. But that’s what happened in many salons during the summer in the 1930s. 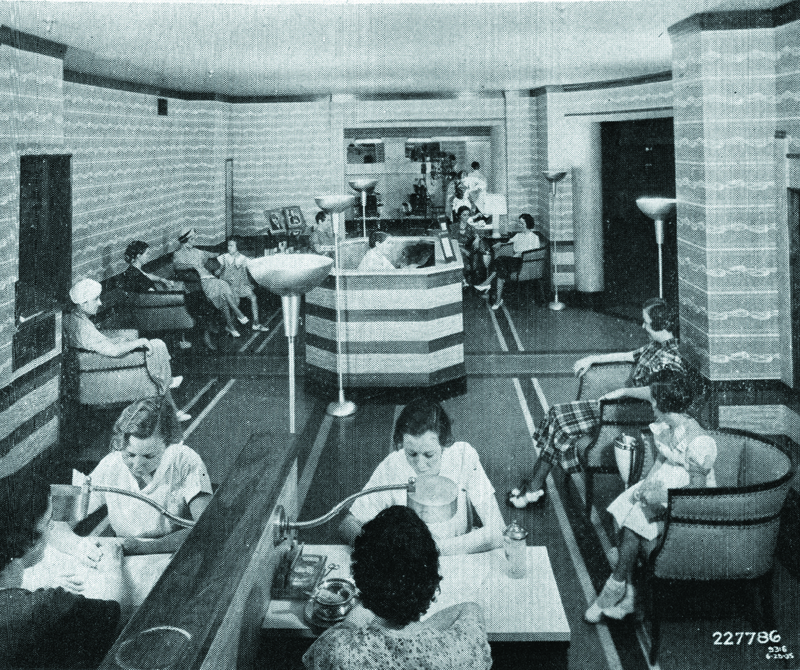 Luckily, the introduction of air-conditioning changed all of that, and cooler salons rapidly became a growing trend. 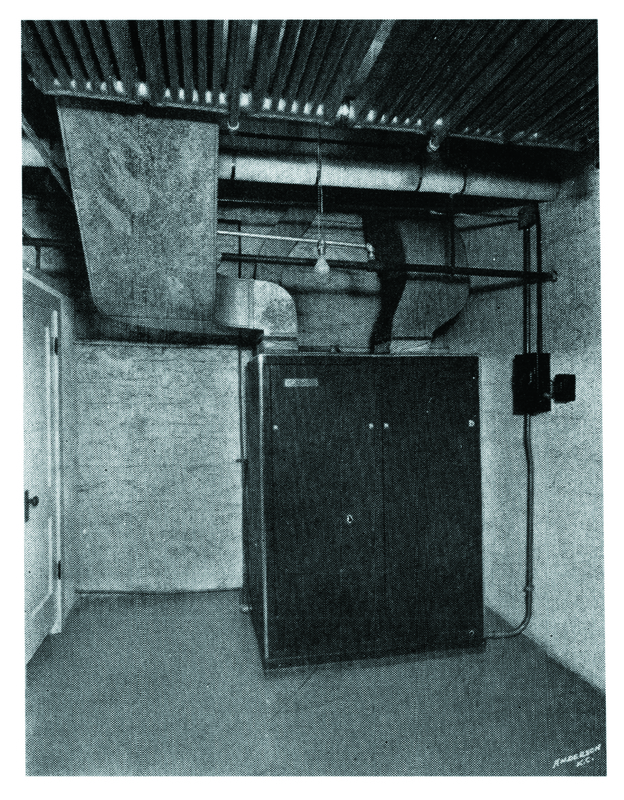 Progressive shop owners throughout the country were quick to install air-conditioning systems as a modern service to their clients. The American Hairdresser wrote countless articles discussing how air-conditioning provided customer comfort and increased business. M.B. 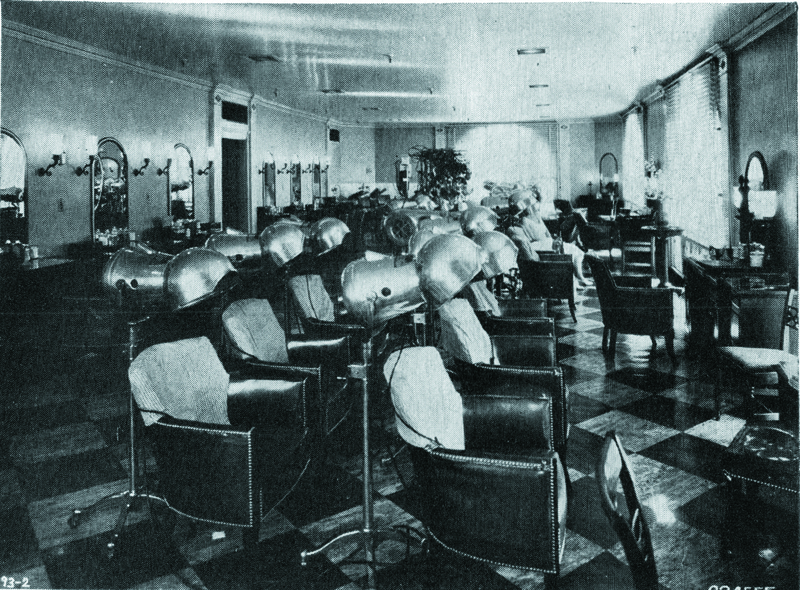 McGavran, owner of the Marie Earle Salon in Kansas City, MO, installed a unit in May 1934, and she doubled her profits that first season. “Many retail stores in Kansas City found it necessary to close every afternoon each summer around 3:30 or 4:00 PM because of the heat. With air-conditioning, however, we had to increase our hours by one hour each day to accommodate patrons,” she says. And her employees felt no discomfort whatsoever—they were not in the least fatigued. In fact, they regretted the closing hours when they had to leave the cool shop. “During the hot months last year, we doubled our salon business over the same period of the year before. In this part of the country, we count on almost five months of hot weather,” she says. In years past, she had a slump of about 33 1/3 percent in the summer months, so the increase in volume of business was highly gratifying. New customers came to the salon and continued their patronage through the winter months. Cancellations ceased immediately, hair drying time was cut down considerably, operators were more efficient, and patrons were delighted and comfortable they didn’t want to leave. McGavran’s account is typical of the interviews The American Hairdresser collected during the decade. Salon owners benefitted from the year-round utility of an air-conditioning system. It wouldn’t be an exaggeration to say that women stayed longer and opted for more services when the salon atmosphere was comfortable and cool. Oh, the wonders of modern technology.